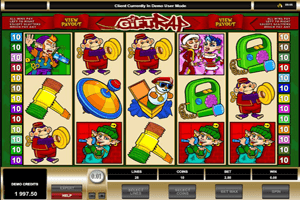 Gift Rap is a 25-paylined video slot machine that has 5 spinning reels. The game is powered by Microgaming and it is all about fun and games. This is why it is called gift rap, as players will spin the reels in order to unveil the rewards that are waiting for them under the gift rap. The symbols all come in great cartoonish visuals and the game is accompanied by a soothing sound track that players will hear every time they start spinning the reels of the game. Play Gift Rap Slot here. These symbols include multiple toys that we all enjoyed as children such as a teddy bear, a toy hammer, dolls, a monkey, a red ball, joker in a box and much more. These symbols can reward players greatly through the line payouts that are paid up when players get a minimum of 3 matching symbols on the lines that they have activated. There are also some other symbols that are special that can help players get paid. These symbols include the red Gift Rap red bubble which acts as wild icon that will replace all other icons on the reels of the game to help players get rewarded. There is also the scatter bonus symbol, the Jack in the box symbol that will trigger the Gift rap Bonus round through which players can earn up to 32,250 coins.